Once in a while, we start to get tired and disinterested with the look of our bedroom. It just seems to lack character which it shouldn't. Your bedroom must have an appearance of serenity and must reflect your personality, style, and taste. You can achieve this with wall decals. It all depends as I said, on your personal taste, for instance, will you rather have a bedroom that is light and airy, or dark and cosy? Do you tend towards the traditional theme as opposed to a modern one? Are you the only occupant of the room or will you share the space with your spouse? Perhaps you are worried that you'll need to spend lots of money to upgrade or change the mood of your room, wondering how much it will cost for a makeover. But having a tight budget doesn’t mean you can’t transform your bedroom or any other room of your home for that matter. If your bed and side tables already have a predetermined position, that’s fine. In fact, you can completely change the theme of the room without moving a single item of furniture out of position. It is certain that your bed is placed against the main wall of the room so this can serve as a feature wall. All that's required is to make this wall more exciting to achieve a total transformation. and applying wall decals (or stickers) on this wall is an affordable way to accomplish this. The themes you can use are endless and range from vibrant and dazzling to calming and mood inspiring. The bottom line is that you want it looking great and aesthetically pleasing. Decal sizes vary from small to large, and the bedroom’s size and expanse of the wall you intend to apply it on will determine the size(s) you choose. Also, there are hundreds of themes you can use, and you can even create your own design if you are creative or ‘interior decoration inclined’. Themes and scenes range from the classic, as in stained glass designs, to nature themes of trees, Venice canals by night, stars, and butterflies. There are picturesque views of city skylines, exotic beaches, and shooting stars. Inspirational quotes are quite popular and if you love ‘cityscapes’ at night, you can only get those with wall murals. 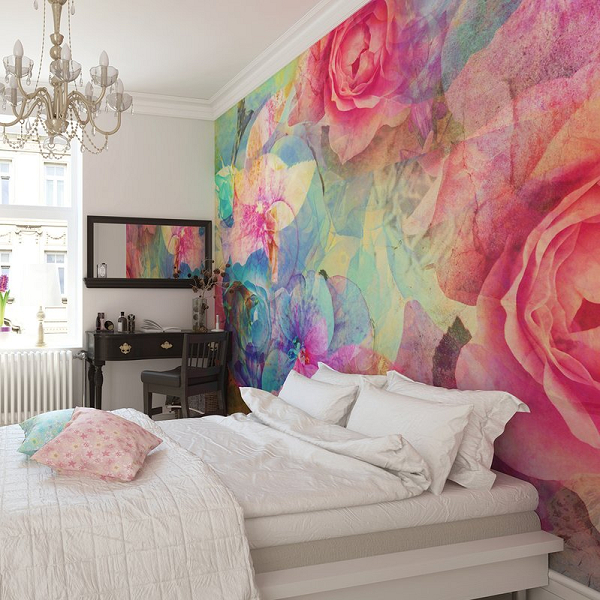 A beautifully reproduced artwork made into a wall decal. Made of a non-toxic polyester fabric material, it can be removed and repositioned at will. 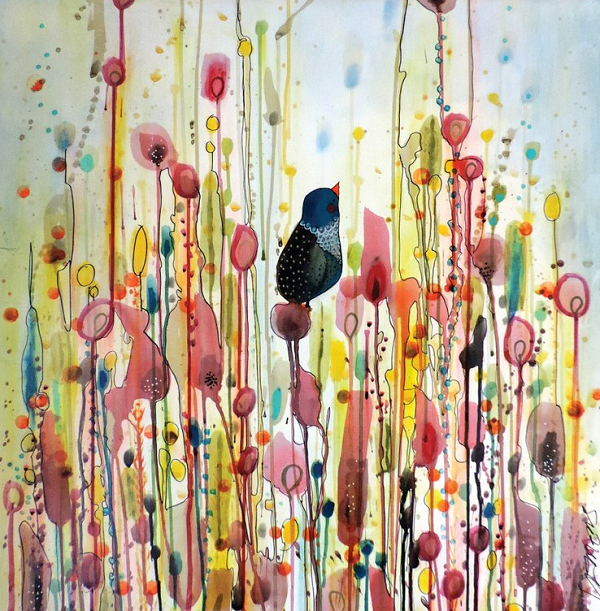 Make your bedroom lively and exciting with this beautiful artsy Bird and Flowers watercolour painting wall decal, a reproduction of abstract bird and flower painting. Not only is it bright and colourful, it will liven-up your mood if you are someone that loves an infusion of colour. Applying it is is mess-free, and it is removable, repositionable, and also eco-friendly. Soft and pretty wall decal that creates a handpainted effect sweeping across the entire wall surface. Looks great on walls with a white or pale coloured background. For a less dramatic look, opt for soft pastel colours with patterns that won't fill up the entire wall. 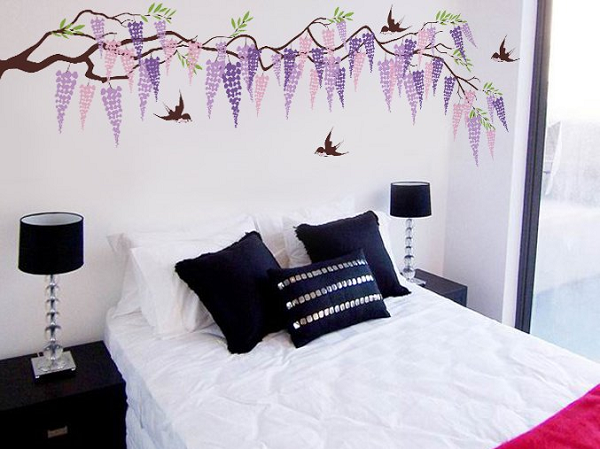 This beautiful Wisteria Wall Decal will brighten and pretty-up your room, giving it a feel of Spring and a festive life and personality, instantly transforming any room. Inspirational wall stickers are wonderful mood-lifters that will encourage and inspire you everytime you walk in or around your room. Wake up to inspiring messages every morning. 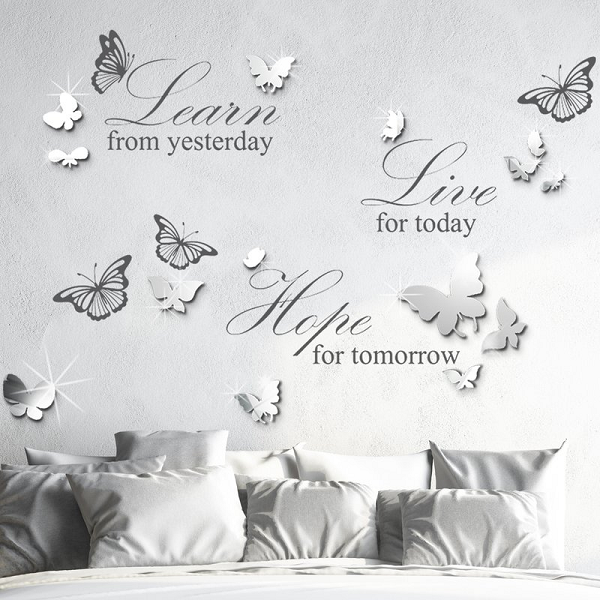 Quotes decals like this - 3D Mirror Butterflies wall decal will not only give you the inspiration to face the day ahead, it will encourage you and brighten up your mood whenever you feel down. A headboard decal that's great for platform beds or those without a headboard. A queen size bed will accommodate one decal. 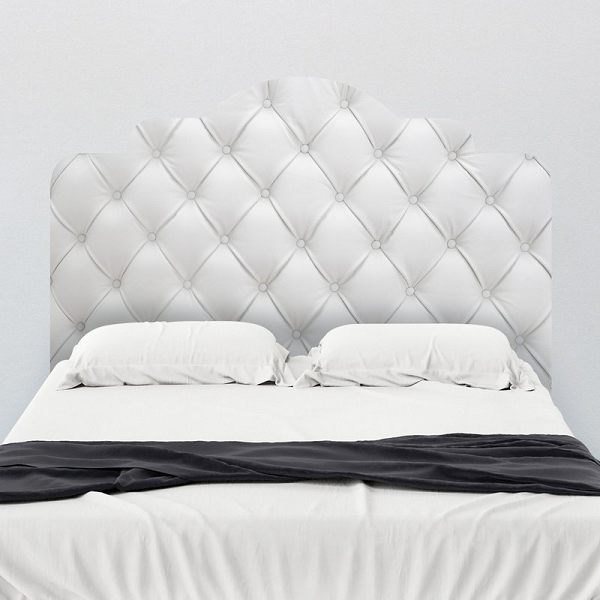 This Faux Tufted Adhesive Headboard decal is designed to dramatically transform the look and style of your bedroom without having to purchase a headboard or have the bulk of a traditional frame. All that's required is to simply peel and stick it to create an illusion of elegant style. A room fit for a princess, this decal will be a little girl's delight. Transform a little girl's room into a fairytale paradise. 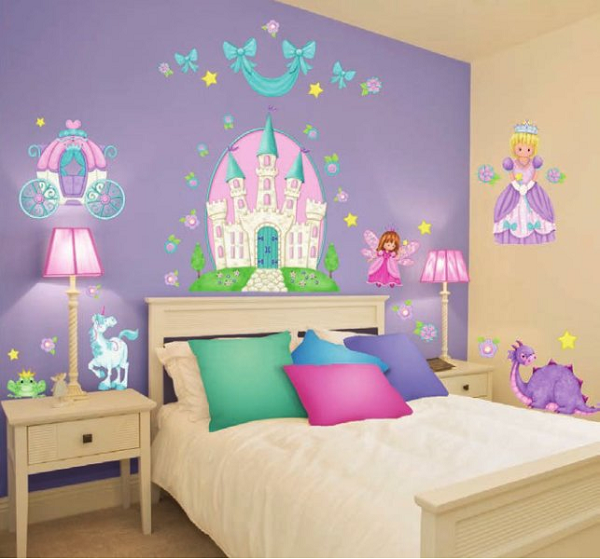 This Princess Camryn Super Jumbo Appliqué of vibrant princess images comprises of 47 pieces of stickers which you can easily apply (on a smooth wall surface) yourself in a stylish and creative manner. 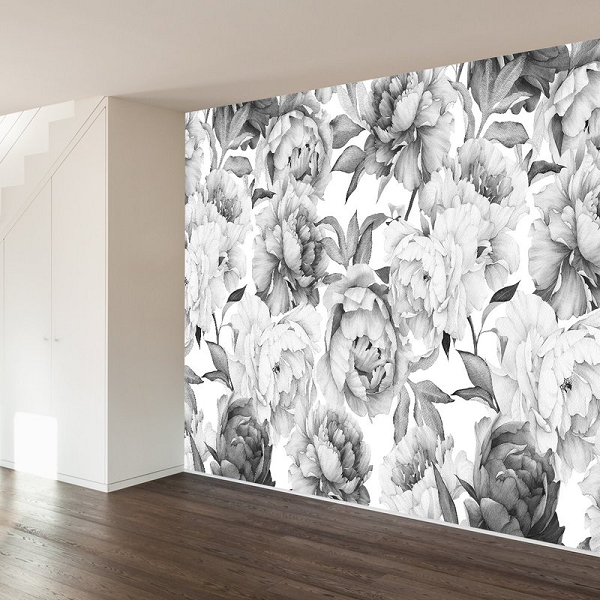 This wall decal that comes in 4 to 6 panels will make a great feature wall. Create a feature wall in the bedroom with a full wall of a striking (or subtle) decal sticker and paint the remaining bedroom walls in a colour that will complement your choice. The above decal - Clara Wall Decal has neutral hues so will go well with most bedroom decor styles. Perhaps you'll like your bedroom to appear like a modern penthouse apartment with a sky or cityscape theme or a quiet countryside theme that's both peaceful and serene. Whichever type you'll like doesn't matter as long as the end result is a total transformation of the room. With the vast choice of wall decal styles that are available, there is bound to be one that suits both your personality and style.